I arrived at Hippo Hollow too early to check into my room, so spent some time wandering around the estate and trying to book myself a game drive. Travelling by myself, I needed a group to be already going and a space to be available in the vehicle. I called Michelle from Thompson Tours & Safaris to see what was going. She told me that there was a night drive into Sabi Sands that night with a group of Canadians. 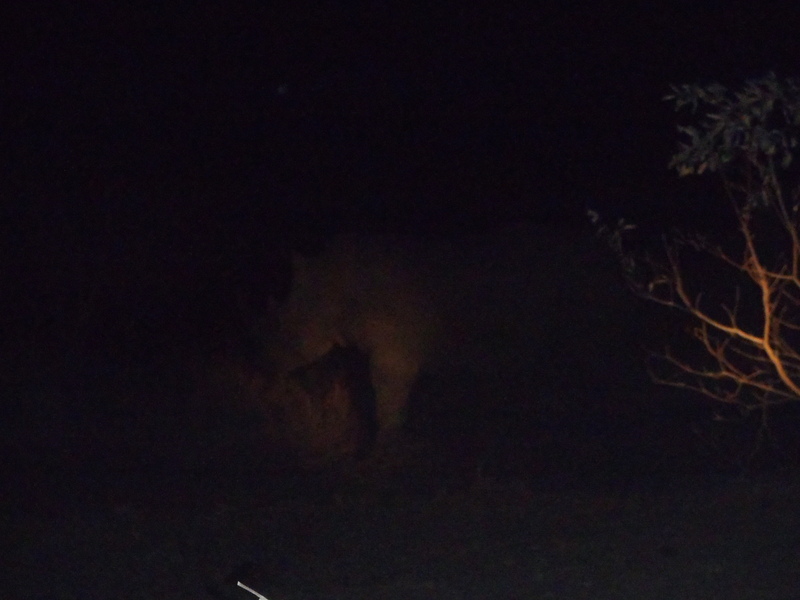 I jumped at the chance of getting to explore the bush in the dark. 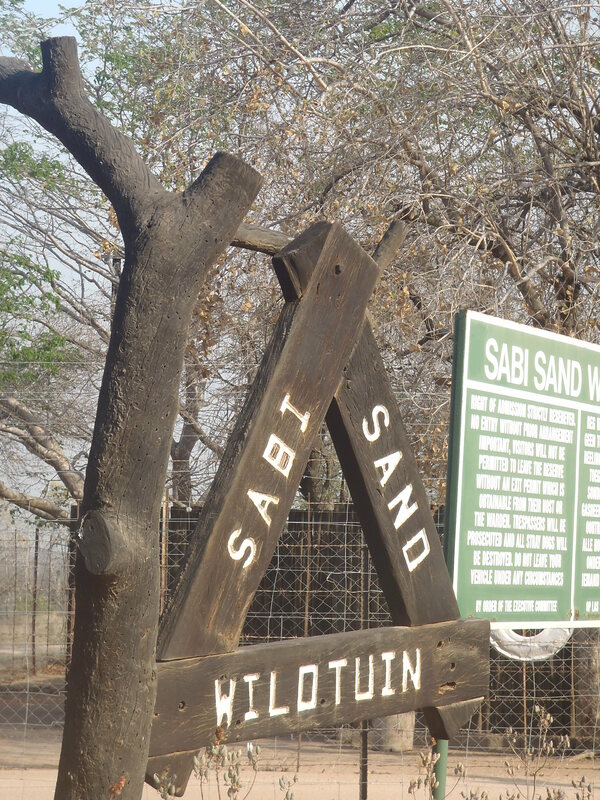 Johann from Elephant Herd Safaris picked us up from Hippo Hollow and we drove to Sabi Sands. There we were joined by Evans who perched on seat at the front of the Nissan’s bonnet, the usual spot for the tracker. Having entered the park we were given instructions to call ‘stop, stop, stop, stop’ if we saw anything. Johann would stop and manoeuvre us closer to the animal so that we could take pictures. The initial destination was the Herman Lodge where we would be served tea. 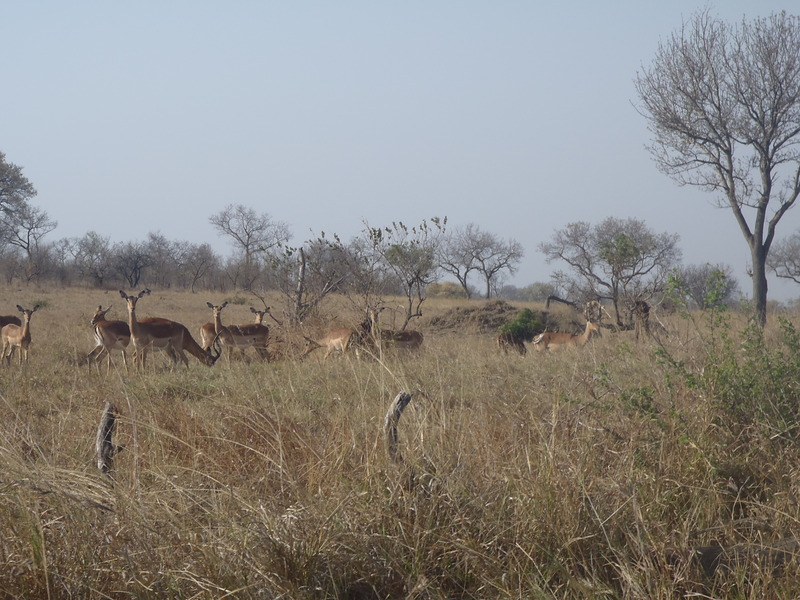 On the way to the lodge we saw Impala and Kudu bulls, of which we saw many more as the trip continued. There was a radio in the front and Johann used it to communicate with his fellow drivers about sightings of animals. 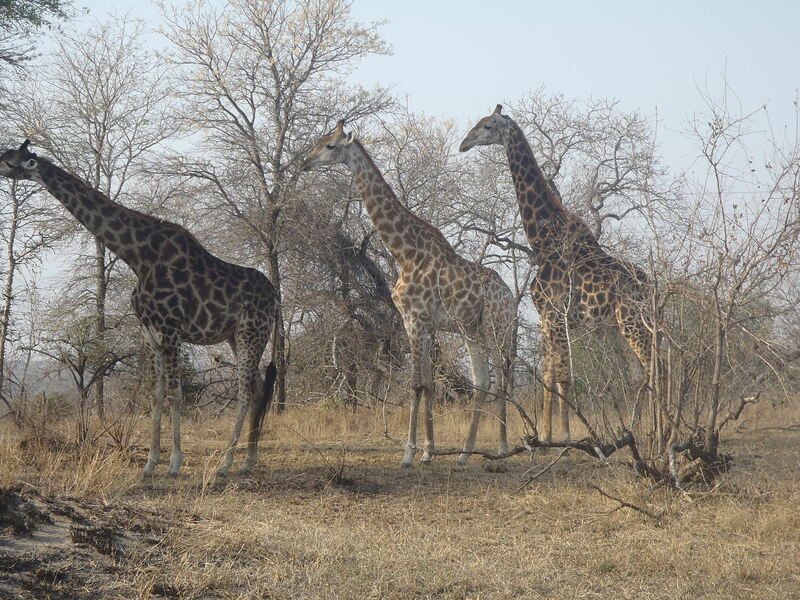 Before we heard about any sightings, we encountered a group of giraffes. Johann reached for the radio to let others know and while he was manoeuvring the vehicle to give us better vantages for pictures, other groups arrived. The giraffes were completely unperturbed by the commotion around them and continued to strip the thorn bushes of their leaves. Having taken our pictures, Johann drove us on to the lodge. 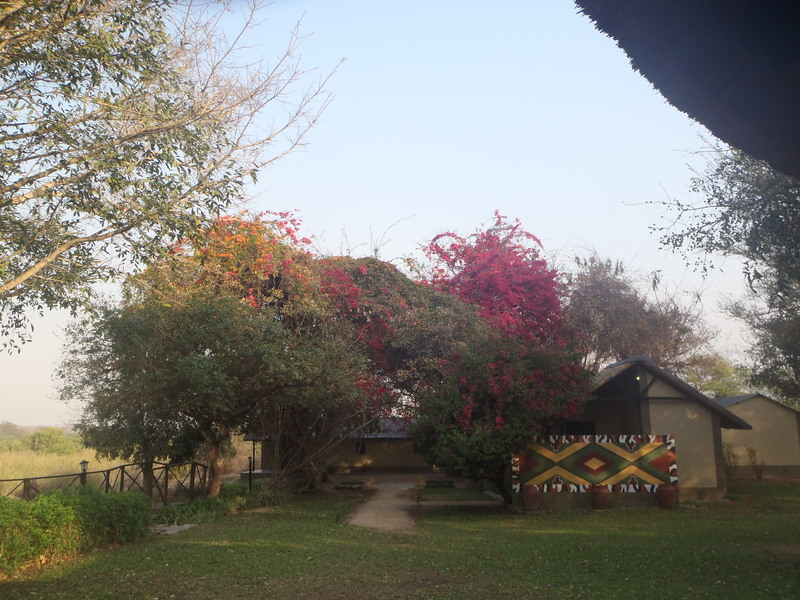 There are chalets there for approx 12 guests and a dormitory for a further 14 guests who want to stay in the private game reserve. There are 42 different landowners who work together to maintain the whole area. The extent of cooperation varies however there are no fences between the plots to enable the animals to roam freely. People need to be a bit more careful and all those working and living in Sabi Sands know where the borders are and which can and which shouldn’t be crossed. After tea we set out to find more animals. 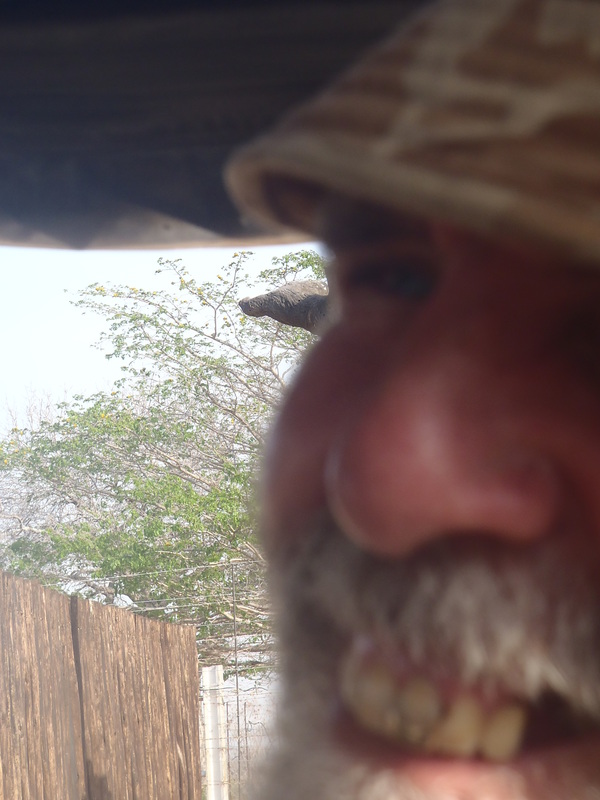 Johann had hurried us along as there were reports of elephant sightings in the riverbed overlooked by the lodge. Slightly ‘downstream’ of the lodge, if you can be downstream in a riverbed which is currently dry! The riverbed is filled with bamboo, which looked about one and a half times the height of a man. We left the lodge and turned along the track to the riverbed and there, over the top of the bamboo I saw the trunks of two elephants. The bamboo was obviously the height of an elephant! Johann circled around the bamboo in the hope that they may move to a sandy section of the riverbed and show themselves to us. Unfortunately it wasn’t to be, they must have been having fun in the bamboo and didn’t want to play with us. Not long after leaving the surrounds of the lodge, Evans pointed out zebra grazing close to the road, unfortunately with their backsides facing us and no obvious intention of turning around to allow the humans watching to take more flattering pictures. It seemed like the animals continued to be winning at the hide & seek game, hiding a lot better than we could seek them. The radio was also quiet, that afternoon it seemed like there just wasn’t anything about. We stopped at sunset at the railway line, which has no tracks anymore. It was the railway along which allegedly Paul Kruger buried/lost a treasure. Johann got out a cooler and we all had a refreshing beer watching the sun go down. As we bundled back into the vehicle, we put on our jackets and fleeces as the temperature drops significantly once the sun has set. We were told that once it was dark we should adjust our cameras not to use flashes as they can startle the animals and cause all sorts of havoc to them and us. We continued on in the dark, Evans now holding a large torch powered by the cigarette lighter outlet, sweeping the beam of light from left to right. Still the radio stayed silent. Johann occasionally radioed other drivers to find out whether they had seen anything and they were drawing the same blank as we were. We continued and Evans found a white tailed mongoose as it ran off into the bush. It was a clear demonstration of his spotting skills as had it not been pointed out to me, I would never even have known there was an animal there, attributing the movements to the blowing wind. Suddenly the radio crackled to life and Johann put his foot down. A particularly shy and skittish leopard had been spotted at the second clearing. 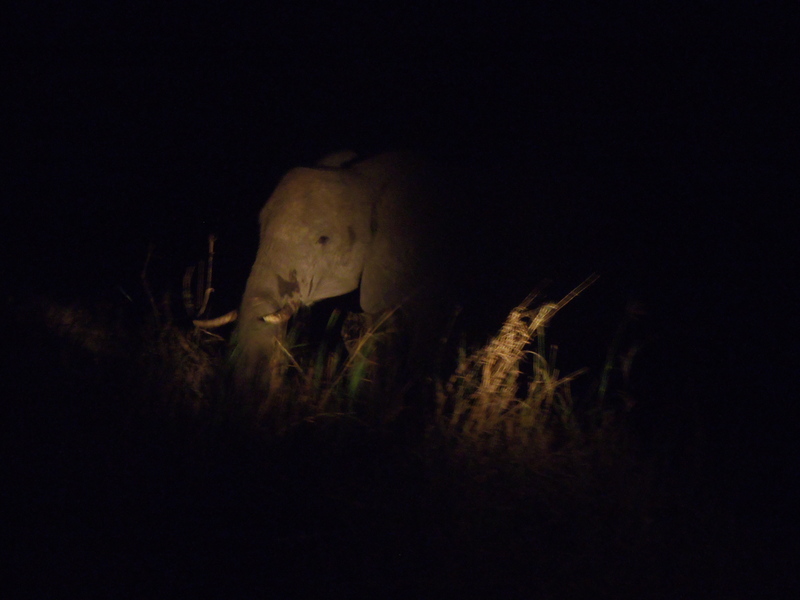 Having completely lost any sort of orientation even before the sun went down, I was amazed at the speed with which we made it to an area I wouldn’t have called a clearing, but at which there were 2 other night safari groups. The drivers discussed how to move around the clearing so that as many would catch a glimpse of the cat. The big advantage of a private game reserve is that the owners make up the rules, which in this case did not include having to stay on marked tracks. Johann launched the truck into the bush between two trees following the directions he had from the others. Breaking back out onto the road, Evans indicated with the torch that he had seen tracks. He instructed Johann to drive slowly along the dirt road following the paw prints left behind by the leopard. Her tracks led into the bush to the left, but over a tree-trunk which Evans and Johann both thought we perhaps shouldn’t try to launch ourselves across. 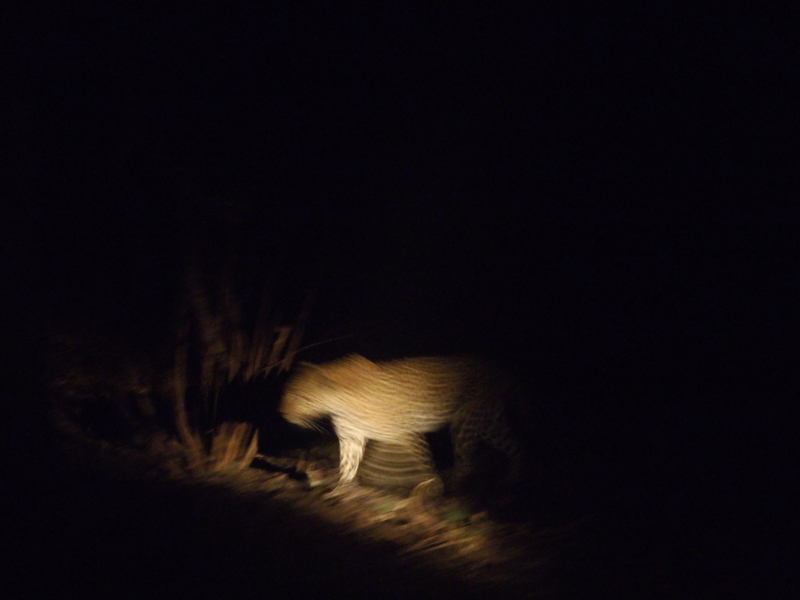 We continued looking for her and every time the torch caught two seed pods next to each other I thought I was seeing the reflection of eyes and we would get to see leopard. It was not to be. We returned to the lodge for dinner, where we met the other two groups who had been out. They had seen the leopard. We were so disappointed that we had missed her. Johann kept telling us that the night wasn’t over yet, we still needed to get out of the park after dinner and you never know what may lay in store for us. 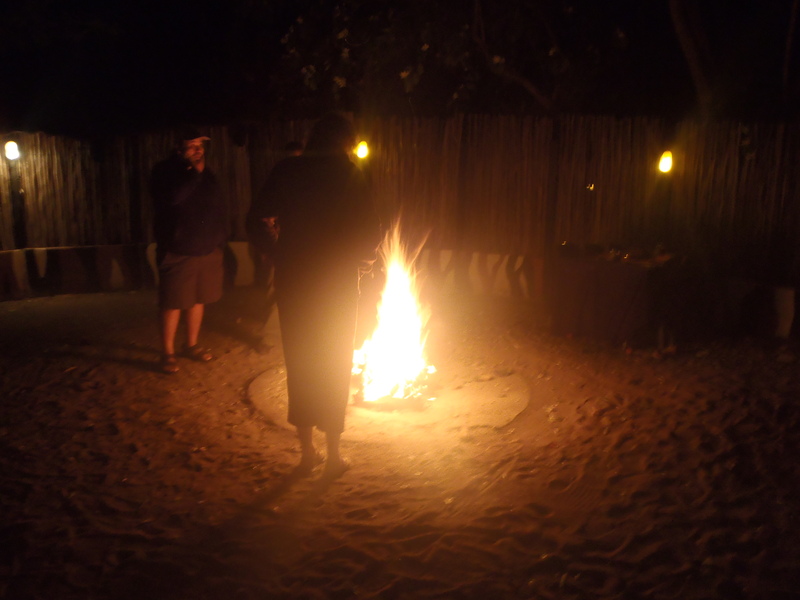 So we tucked into our lasagne and salad at tables set around a fire pit followed by desert. Again, Johann hurried us away – the elephants had been seen again. Out into the vehicle we bundled, turned out of the lodge and pretty much immediately saw an elephant mother and child trundle off the track. The mother turned and looked at us, making the child stop and look as well. To us untrained safari-ists the child looked like a baby, Johann told us it was probably a 5 year old. Elephant females stay with their mothers their whole lives as part of the herd. Males leave to go and find their territory at an age between 15 and 20 years of age. Not dissimilar to human boys… A little further on was another young-ish elephant just standing and eating while we watched him chomp away at the bamboo. Evans pointed out that a hyena was approaching the elephant and Johann told us to watch what happened. We didn’t expect the hyena to do anything to the elephant and true enough, it didn’t. It wasn’t even aware the elephant was there, so as the elephant nonchalantly waved its trunk in the direction of the hyena it suddenly shrunk back and scuttled away into the undergrowth. We felt a bit better after that, we had managed to see one of the Big 5 close at hand, relaxed and just living his life, as the owners of the reserve intended. To find the elephants we had taken the ‘long way round’ from the lodge to the gate and were now making our way back to the exit. Suddenly Evans shook the torch vigorously on the left side of the direction we were travelling in. A leopard! Slowly meandering towards us, just a couple of feet off the track. Johann selected reverse and we drove backward as the cat continued to walk towards us. He was an amazingly elegant mover, sleeking along, prowling his land. We heard some rustling on the other side of the track and Evans found an Impala standing there. I for one hoped the leopard was hungry and would go on the hunt right in front of us. But only because there is food there, he wasn’t going to eat it! Like many a cat, unless he needed it he wasn’t going to hunt. He sauntered past what could have been his dinner and we carried on following him with our eyes as he turned towards his right and plodded along without a care in the world. 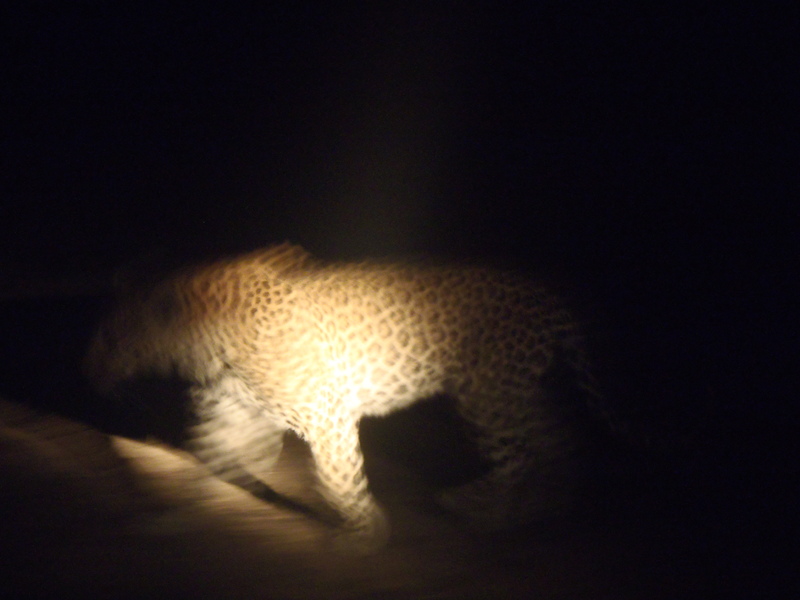 We had now seen two of the Big 5, including one of the most elusive of them, the leopard. The whole excursion felt like really worth it. You always take your chances on safari, the whole point is to see the animals in the wild and although they may have routines, they will always been unpredictable. Feeling all proud and looking forward to telling my friends I’d seen a leopard, I settled into my seat and snuggled into my fleece. Evans was still sweeping the torch from left to right in front of us. As I was sitting on the left side of the vehicle I tended to look that way and suddenly saw a large thick-skinned animal. I completely forgot the ‘stop, stop, stop, stop’ instruction and called out Hippo, although it was actually a Rhinoceros. Again, we were far more excited than the animal (which in a Rhino’s case is probably quite good). We can’t have been more than 50 feet away from it. I’d never seen a Rhino this close and still can’t quite get over its size. It was about the size of transit van. Somehow having seen elephants in Zoos I was content and accustomed to their size, but the Rhinos I’ve seen before can’t have been fully grown. After we had stopped alongside him, he carried on chewing and swallowed his food. 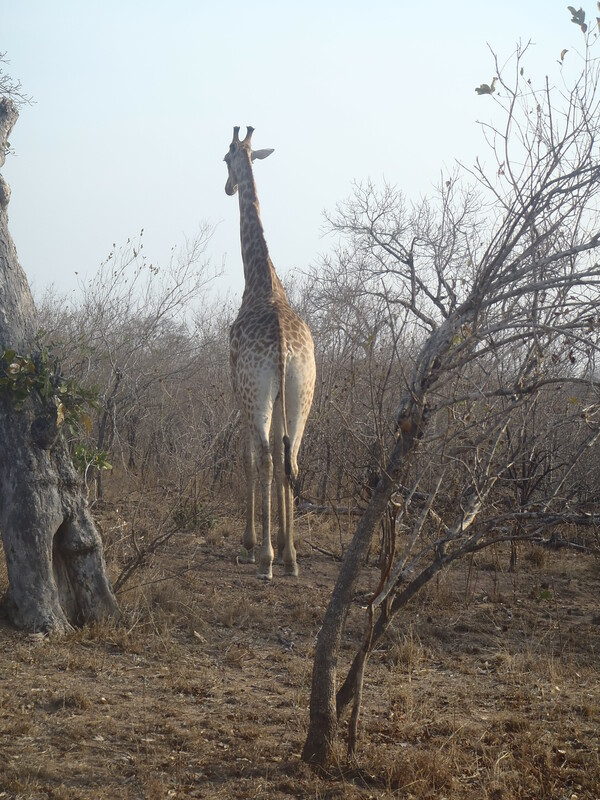 Then he gave us the African Salute of turning his tail towards us and trundling off through the thicket. Having been jealous of those in the other groups who we’d had dinner with, I now felt smug as we approached the gate. Finishing off the paperwork at the gate, Johann also handed out blankets. Once back on the road we would be travelling faster than through the Reserve and may want to be wrapped up a little more. Evans jumped off the front about 200m outside the gate, apparently he lives in the bush a little way ‘down that track off the road there’ which you would only be able to walk down. Without a spotter sitting up front, Johann accelerated and sped us back to the Hippo Hollow where we arrived tired and happy about 10:30pm. If you ever get a chance to do a night drive – do it!